Anjou Renassiance Gown for sale encapsulates the romance of the Renaissance Period. This courtly gown is manufactured of 100% cotton. The Anjou Gown features gorgeous brocades and extravagant trims. The gown features rounded shoulders for a historically accurate detail. This gorgeous gold gown has an elegant lace up back. 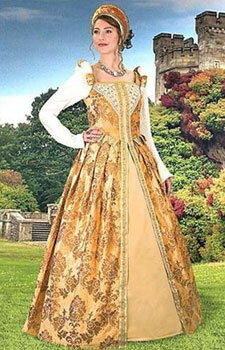 These dresses can be worn as a beautiful Halloween costume or worn at any Renaissance festival or medieval faire. Fit for a queen, this golden gown could even be worn as a wedding dress. Buy the beautiful Anjou Gown for $339.99. 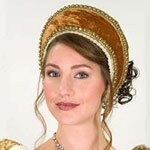 Tudor French Hood for sale is the perfect head piece for any historical or renaissance gown. These elegantly simple hats feature a stiff interior with a cotton velvet exterior. 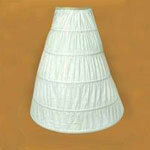 The popular Tudor French Hood has a white Tudor edge with gold trim. These medieval hats can be worn as a beautiful accessory to any Halloween costume, or worn at any Renaissance festival or medieval faire. Buy the Tudor French Hood for $49.99.